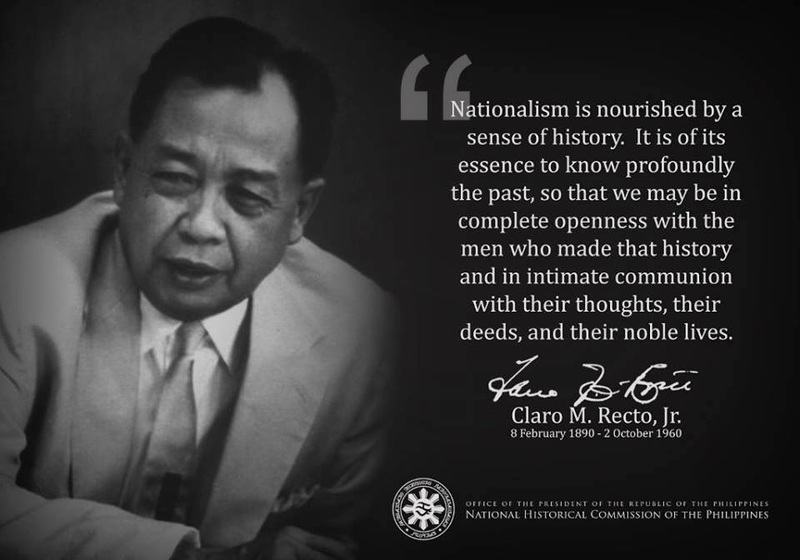 WHAT WE FILIPINOS SHOULD KNOW: Any truly nationalistic leadership and people struggling for the common good will be faced with serious threats inside and outside their country. Being pro-poor, i.e. fighting for social justice, or more specifically, against poverty (its manifestations in the culture of poverty and illiteracy),is not acceptable to existing US foreign policy, which under the mythical proclamation of fighting for democracy and freedom, is in reality geared primarily to support the objectives of American transnational corporations. US foreign economic and military policies are based on its historical pronouncements of the Monroe Doctrine. The Monroe Doctrine was decades later followed by the bully threat of the Roosevelt Corollary. Thus, any nationalistic leadership and populace in the homeland can expect and will be confronted with all the influence, covert and overt power of American foreign and military policies should nationalists attempt to gain power, move to diminish and/or dismantle American economic interests in the homeland. America has demonstrated such machinations in numerous instances in the homeland and abroad; To name a few: Cuba, Chile, Haiti, Dominican Republic, El Salvador, Nicaragua, Panama, etc. America worked and is working in earnest to stifle, defeat and/or remove the recent upsurge of pro-poor leaderships and governments in Latin America, i.e. Hugo Chavez on Venezuelan social transformation. REALITY: Hugo Chavez was elected president in 1998 with 56 % of the vote. After a new constitution was ratified by popular vote (80%), he voluntarily put himself up for election again in 2001. He won this election with 59 % of the vote. In 2004 he was subject to a recall referendum, a process that did not previously exist in Venezuela but that he had added to the constitution. He won this referendum with nearly 60% of the vote. The election was overseen by several international organizations, including the Carter Center, all of which declared the elections free and fair. 2. MYTH: Chavez is destabilizing South America and the Caribbean. REALITY: Venezuela has joined in many cooperative relationships in South America and the Caribbean. Following the examples of nineteenth-century Latin American liberators Simón Bolívar and José Martí, Chavez has promoted an all-inclusive Latin American “great homeland” (“patria grande”). A few examples of this include Venezuela’s incorporation into Merco Sur; assistance in the creation of a South American television station TeleSur and oil enterprise PetroSur; and the building of a pipeline with Colombia. Petrocaribe is a new Venezuelan proposal through which 14 Caribbean counties will receive oil at preferential prices, and currently Venezuela has an oil-for-food accord with Argentina. 3. MYTH: Chavez supports narco-trafficking. 4. MYTH: Chavez is repressing the media. REALITY: Venezuela’s privately owned TV stations blatantly and admittedly participated in the 2002 coup attempt against Chavez (see Council on Hemispheric Affairs, “Investigation Memorandum. The Venezuelan Media: More Than Words in Play," Press Memorandum 03.18, April 30, 2003). Yet not one of the stations has been closed, and none of the station owners has been arrested on charges of conspiracy. Under Chavez, several new community TV channels have sprung up, hundreds of new “pirate” radio stations have raised antennas in every corner of the country, and hundreds of community newsletters are being printed. Even independent websites have gone up, including www.el23.net. The Chavez government is helping to jumpstart the continental TV station TeleSur (TeleSud in Brazil) in hopes of breaking the monopoly of CNN and its disinformation reaching hundreds of millions in Spanish and Portuguese. Venezuela’s new Law of Social Responsibility of Radio and TV attempts to regulate the media in the same way that the FCC in the US does. It restricts violent content during high children viewing hours and it also establishes avenues for libel suits to combat slander. The new law, just as in the United States and other countries, makes threatening the President’s life or promoting actions that threaten national security a crime. 5. MYTH: Chavez is propping up the Cuban economy and government. REALITY: First, the Cuban economy relies mostly on tourism and is not in need of “propping up” despite nearly half a century of US economic blockade. Second, Cuba and Venezuela have entered in to various agreements, including ALBA (Bolivarian Alternative to the FTAA, based on reducing poverty rather than raising profits) and the Caracas Accord through which 23 Latin American countries receive preferential oil prices. For Cuba’s part, it has been the key player in Venezuela’s two most successful social programs: Barrio Adentro (BA) and Mission Robinson (MR). Tens of thousands of Cuban doctors are serving for free in community medical clinics throughout the country (BA). The MR literacy campaign used the U.N.-lauded Cuban program “Yo Sí Puedo,” as Cuba trained Venezuelan teachers and provided televisions, VCR’s, workbooks, pencils and even personal library sets to all those attaining a 6th-grade reading level. In the first year of MR more than a million Venezuelans became literate. Cuba also has sent thousands of sports instructors to Venezuela and has treated many Venezuelans with special medical needs in hospitals in Cuba. The US is increasingly isolated in its condemnation of Fidel Castro and the Cuban Revolution. 6. MYTH: Chavez is a communist and is centralizing power. REALITY: According to the Webster dictionary Chavez falls into the category of a populist: “ a believer of the rights, wisdom, or virtues of the common people”. Contrary to communist theory, the Chavez government has handed out millions of private land ownership titles. And instead of taking over the means of production, the government has begun entering into co-management relationships with workers who have taken over control of their factories. The current program of developing endogenous development communities that are self sufficient and locally governed are a profound expression of true decentralization of power to the local level. 7. MYTH: Chavez is building up a dangerous arsenal. 8. MYTH: Chavez is going to cut off oil sales to the US. REALITY: Venezuela has recently made many mutually beneficial oil agreements (and other trade agreements) with not only the US but also other huge oil consuming countries such as India and China. These latter deals, once fully implemented, will lower Venezuela’s dependence on the US as its main purchaser of oil. This does not mean that oil supplies to the US would be diverted to China and India, but instead Venezuela hopes to increase its market. However, this lower dependence on the US will give Venezuela, and by “Bolivarian” definition, all of Latin America, some breathing room and unprecedented bargaining power against US hegemony. This is the crux of US hostility toward Chavez. REALITY: The Chavez government has friendly relations with just about every nation in the world. Venezuela’s relationships with Middle Eastern governments that do not have good relations with the US, such as Iraq, Iran and Libya, stem from their common membership in OPEC, which was created in 1960. And while Venezuela does not maintain close ties to terrorist nations such as Israel, some are legitimately concerned about its economic friendship with the US. 10. MYTH: Chavez government is violating human rights. REALITY: In fact, the Chavez government is the first government in over a hundred years in Venezuela that has addressed human rights in any meaningful way. The Chavez administration’s central tenet is the guaranteeing of basic human rights to the entire population. This, so far, has come in the form of universal health care, education, land distribution, subsidized food, and a participatory democracy. The Bolivarian constitution is the first in the world to recognize the rights of children to a healthy and happy life. It gives unprecedented rights and sovereignty to indigenous peoples and recognizes housework as a value-added commodity that assures women a pension for a life of housework. The signers of the 2002 coup decree that made Pedro Carmona dictator for a day and dissolved the national assembly, nullified the constitution and dismissed the Supreme Court have still not been brought to trial, although some of them are under investigation and possible charges may be brought eventually. Can you imagine participants of a coup attempt against George W. Bush living free three years later (or living at all for that matter)?